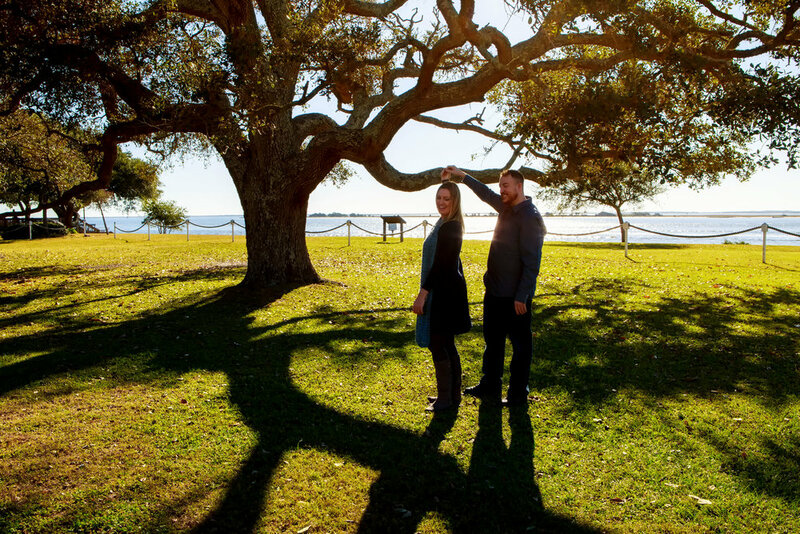 Kathy & Ryan had an engagement session vision in mind for beautiful Southport, NC which was simply a joy to carry out! We spent the afternoon strolling through the town, with focus on the gorgeous landscape and really just getting to know each other in preparation for their big wedding day on St. James Plantation. Engagement sessions should not just be time spent posing in front of someone's camera, but a chance to spend a little time with one another, to ease into the process of being someone's camera focus, and to get comfortable not only with a lens pointed at you, but the person BEHIND the lens. The photographer is someone who spends just about your entire wedding day by your side, and building a real relationship with my couples is so very important to me! Kathy & Ryan's wedding day was amazing, and I cannot wait to share those images when I get the go ahead from this sweet couple!